The Rosh Hashanah Riders had decided there was no reason to ride quickly today. We were to take a ferry from the bottom of NJ to Deleware and the ferry schedule was 11, 1, 2:30. 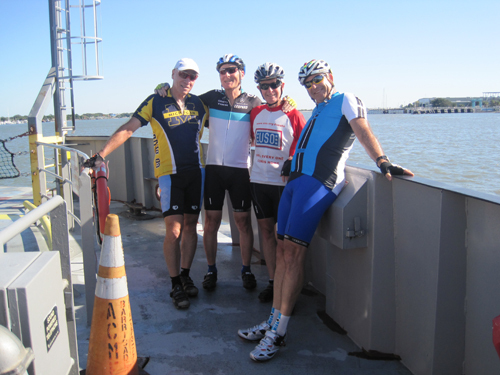 Since we had 3 hours 20 minutes, with a SAG stop, head winds, and many bridges to cross and 72 miles to travel there was no way we could make the early ferry. Jim was first out of the hotel and all of a sudden he was pulling at 22mph into a headwind. 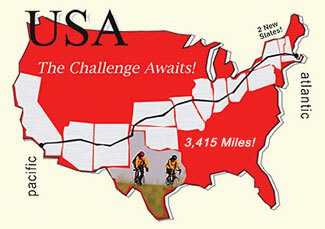 Well we rode fast through some great bike roads, no traffic, smooth pavement, and gently rolling. It was a blast until we hit the Jersey shore, tacky, tacky, tacky. Stop lights every hundred yards for miles along the coast. The day had been overcast with occasional rain until about mile 50. Then the sun came out, dried us out, and we had a pleasant 70 minute ferry ride. Services last night were, hmm, hard to describe. Peter had called me before the ride and suggested we try to do high holiday services. 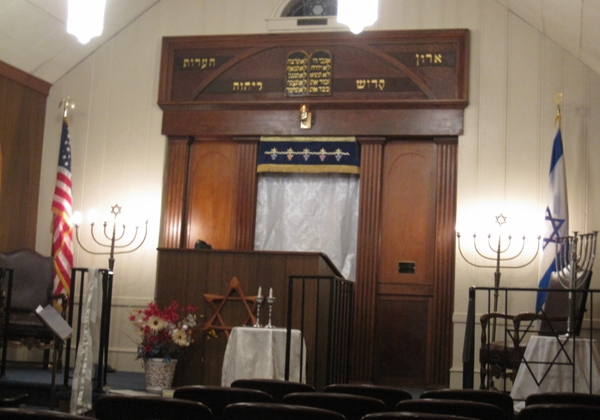 I looked up on the internet congregations in the appropriate cities and had my rabbi call and get tickets. Peter lives in NYC and his chapel holds 2000 and you have to come early to get seats so we went early. There were two people there when we arrived at 7:10. People started to arrive and they all knew who we were. There were only 13 people attending, Jack, Peter, Jim and myself included. And Jim is not Jewish. I found the service impossible to follow (and most of it was in English) but with moments of great amusement. The person leading the service describes the new year as a time of new beginnings, fresh opportunities, to start anew. She then asks one of the two other males attending what this means to him. And I swear I am not making this up, he answers "the playoffs'. Apparently the playoffs are very important to him. She then describes this as a time to examine our surroundings, to be aware of the world around us. What does this mean to you Sierra she asks. Sierra who apparently is a high school student responds "I am going to try to not run into people in the halls tomorrow". I don't know, maybe the schools are over crowed here and this is a big issue. Little know fact: Rehoboth Beach is also known as one of the mid-Atlantic coast's popular gay and lesbian getaways because of the large number of gay-owned and operated businesses. Waiting for the crowd to arrive. 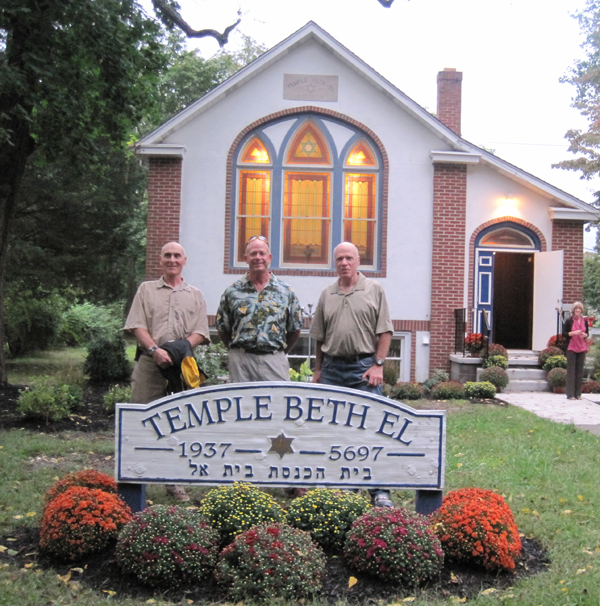 Temple Beth El, Hammonton, NJ. Tacky Jersey Shore hotel. 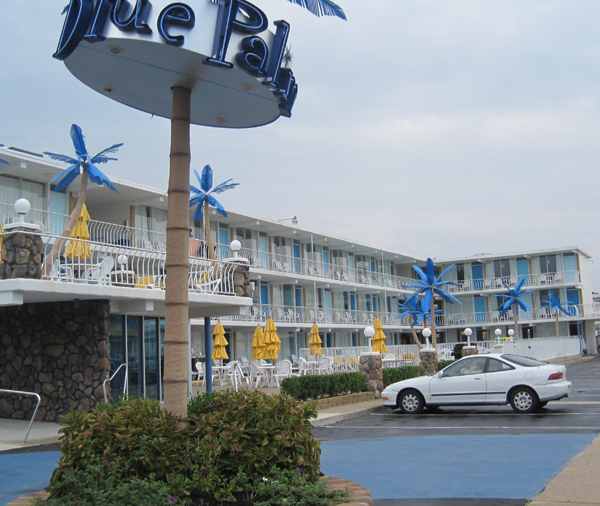 Fake blue palms attract people to this hotel? It is nice to see some blue sky and the smiling faces on the ferry. Did you, Peter and Jack get your picture taken as evidence for the Book of Life? Do you have to have a minion to hold High Holiday services at a temple? A good thing you called in a favor ahead of time, sounds like the new year tix were hard to come by. How about getting me a couple of those palm trees for our next Michigan tailgate? Sent 2011-09-30 from Dave N.
We had more people at services in the farm house in Door County. So where do you end up in Florida? Maybe we'll meet you there.